As a result of the current boom in popularity, there are very few whisk(e)y brands out there that haven’t received at least a little slick, silver-tongued marketers’ magic. Whether it’s a new label, revamped line-up, hip ad campaign, or a hyperactive social media presence, these days, it can easily seem as if the marketing of the bottle is as important as the quality of what’s in the bottle. The Usquaebach brand is a bit of an anomaly in this regard. It’s a small, somewhat storied, though less-well-known line of blended whiskies that seems to quietly occupy its shelf space without all the flash and clamor other brands increasingly employ. Yes, I, too, noticed that though the brand spells it Usquaebach, more often than not the poem spells it usquabae. Perhaps back in 1877 when the brand was established, usquaebach was the preferred spelling. Either way, usquabae is of course derived from the Gaelic, uisge beatha (or Irish uisce beatha) which is derived from the Latin, aqua vitae, meaning, as we all know, “water of life”. While it’s undoubtably romantic to think of whisky being the water of life, it is not. Water is the water of life. If you want to prove this to yourself, drink only whisky for a month, and only water your plants with whisky for a month and then see how life is going for you and your plants. I digress. Like I mentioned, Usquaebach the brand was first trademarked in 1877 by Inverness booze company named Ross & Cameron. Ross & Cameron reportedly got their start as whisky salesmen in 1800. In 1926, the brand was placed in the hands of William Grigor & Son, who also went on to purchase Bowmore in 1950. In 1969, the brand was purchased by the curiously named Twelve Stone Flagons, Ltd. It is important to mention that the company was simply named Twelve Stone Flagons, and the brand was actually purchased by a human not a dozen entrepreneuring ceramic vessels. The person in charge of Twelve Stone Flagons, Ltd. was the gracefully named Stanley Stankiwicz, under whose reign the use of an actual stone flagon for one of Usquaebach’s whiskies began. In 2005, the brand changed hands again, this time being bought by the small New Jersey-based importer Cobalt Brands. 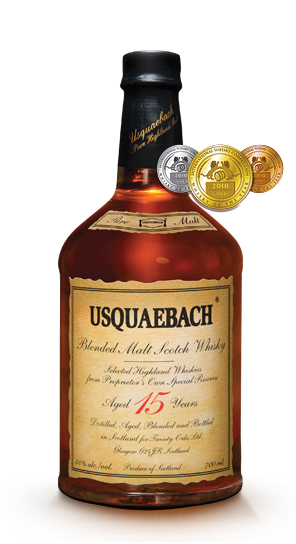 Today the Usquaebach line is represented by three whiskies: the “Old Rare” Blended Scotch Whisky, which is the most visible of the trio thanks to its unique stone flagon, the “Reserve” Premium Blended Scotch Whisky, and this one, the 15 Year Old Blended Malt which is comprised of malts aged between 15 and 20 years old, and aged in a combination of cask types including ex-sherry. The Nose: A nice, casually sweet, rich nose with lots of honey initially, honey butter even, and maple syrup over vanilla ice cream. There’s also raisins in rice pudding, bruised apples, and a little grilled pineapple. Subtler notes of holiday fruit cake with the dried fruit and the usual spices. Further back, there’s cinnamon and sugar mix, old oak, and faint, musty notes of, and I hate to get this specific, an old Scotch dunnage warehouse. The Palate: A little more muscular and aggressive than the nose. The sweetness is now more burnt caramel and toffee than honey, with plump raisins and more vanilla. Very dark chocolate and salted nuts move quickly into more vibrant spice, rough oak boards, drying clove, allspice, coriander, and quite a bit of fine ground pepper. The palate comes across a bit more edgy than its age would imply. The Finish: Medium-ish, more of that burnt sugar sweetness, dark chocolate, oak, and drying spice. Is that a faint trailing wisp of smoke? Thoughts: Quite decent, though somewhat Jekyll and Hyde-ish. The nose is quietly rich, a little unassuming, languid and sweet. The palate is more up-front and robust, trafficking more in the spice notes with greater astringency. The two did find more common ground as the glass ran down. I would definitely not call this a heavily sherried whisky, but the sherry cask influence is pleasantly, subtly there. Overall, a nice, teenage blended malt. For around $70-$85, I’m on the fence as to its value, but for those who like a slightly sherried, slightly rugged, off-the-beaten-path whisky, it’s worth a look. Recommended.